With it's comfortable padded terry liner, high degree of adjustability, and unprecedented ease of use, this WHT orthosis is heads and shoulders above custom splints for managing contractures. It's quick and easy! No heat is required -- simply bend to fit. It can be adjusated virtually anywhere -- at the bedside, in the clinic, or in the patient's home. The malleable aluminum splint core is adjustable in all areas: forearm, wrist, fingers, and thumb. It allows you to customize the fit for most any contracture and it can be easily modified to meet the changing needs of the wearer. Adjustable for comfort or as needed as the contracture is reduced (or worsens), while sufficiently strong enough to maintain the patient's hand or wrist position. Top and bottom is laminated with flexible cloth-covered foam that protects the wearer from any metal edges and providing an absorbent, cushioned resting surface. Padded, removable, and washable terry liner ensures that skin integrity is not compromised and protects skin from pressure. Keeps skin cooler and drier than a hard plastic splint. Comfort and skin protection mean better patient compliance, and that means better contracture management! 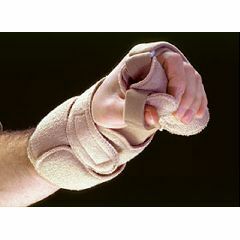 And it's low-profile splint design helps maintain patient's dignity. The finger portion of the splint is relieved to provide a natural resting trough for each finger, helping to keep fingers appropriately aligned. This finger platform can also be rolled or bent to azccommodate any contracture and can be modified for use in progressive spliting. The wrist angle may be modified from 75° of flexion to 45° of extension; the thumb piece can be adjusted to accommodate any degree of abduction or flexion -- even the forearm cuff can be adjusted to accommodate any size forearm! What are the the measurement parameters to determine whether or not this splint will fit my student?